“Nature is constantly striving to reach balance and equilibrium. 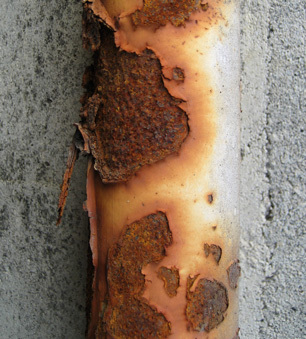 Corrosion is the natural deterioration of materials by chemical and physical interaction with the external environment. Man creates, and nature destroys; this is the essence of corrosion.” — Greg Reyneke. Water Conditioning and Purification Magazine, April 2010. Tastes and Odors. Corrosion by iron, copper, and brass make bitter or metallic taste and sometimes odors. Chlorine and Chloramine. These common disinfectants lead to the breakdown of both metals and rubber materials. Chloride. Chlorides are the enemy of stainless steel. Treatments for corrosion, obviously, are many, since the causes are many. Some common treatments are increasing pH, reducing chlorides (reverse osmosis), reducing chloramines and chlorine (carbon filtration), turning down the hot water heater, filtering out excessive sediment, or decreasing the demand for flow through the piping.